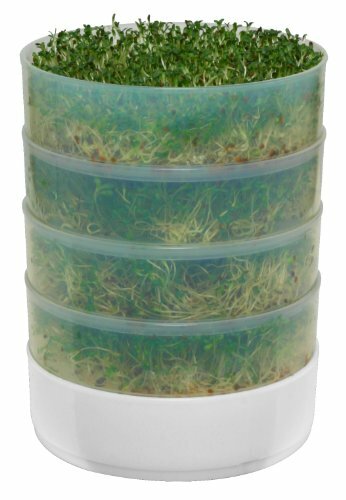 The Victorio VKP1014 four-tray Kitchen Seed Sprouter is an easy way to produce fresh, high-quality organic sprouts in your own kitchen. New and improved design is simple to use and very durable. Unique growing tray design uses water surface tension to keep the correct amount of water in the tray for all stages of the growing process. You can enjoy sprouts in as little as 2 to 5-days. Includes organic alfalfa sprouting seeds, 4 growing trays, 1 water collection tray, 1 storage lid and instruction manual. Each tray is 6-Inch by 1-3/4-Inch. Sprouter can be expanded to 8 total growing trays (extra growing trays sold separately). Sprouter is 8-Inch high and 6-Inch wide. Top rack dishwasher safe if removed before the dry cycle. Trays are made from strong, crack resistant, BPA free plastic. Made in USA, 2-year warranty.